Touch the Photo icon from the menu bar. 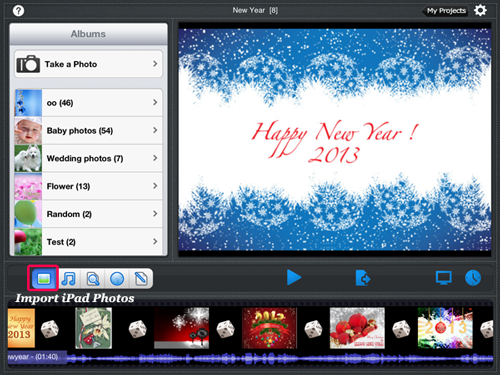 All your iPad Photo Albums will be listed, choose albums and touch photos to import them. Or you can tap "Add All" to add all photos in one album. 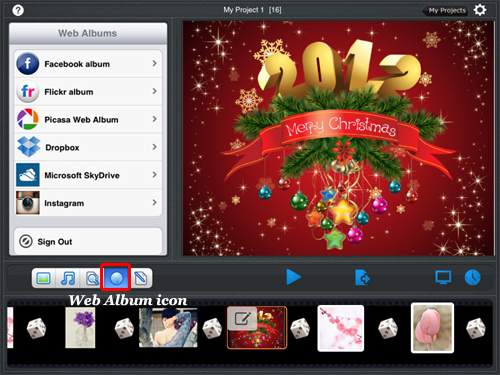 1.2 Import Photos from Picasa, Flickr, Facebook and other web albums. Also the app enables you to import photos from web albums, including Facebook, Picasa, Flickr, Dropbox, Instagram and Skydrive.To use photos in web albums, please tap the web icon first, then you can see a list of web album icons from which you can import photos. 1.2.1 Import Photos from Facebook Album.Choose Facbook album and enter your email account and password then sign in. Tap photos you want to use and download them the app. 1.2.2 Import Photos from Flickr Album.Choose Flickr album and enter your Yahoo ID and password then sign in. Tap photos you want to use and download them the app. 1.2.3 Import Photos from Picasa Album.Choose Flickr album and enter your Yahoo ID and password then sign in. Tap photos you want to use and download them the app. 1.2.4 Import Photos from Dropbox.Choose Dropbox and enter your email and password associated with your Dropbox account then sign in. Tap photos you want to use and download them the app. 1.2.5 Import Photos from SkyDrive.Choose SkyDrive and enter your hotmail and password associated with your SkyDrive account then sign in. Tap photos you want to use and download them the app. 1.2.6 Import Photos from Instagram.Choose Instagram and enter your hotmail and password associated with your SkyDrive account then sign in. Tap photos you want to use and download them the app.